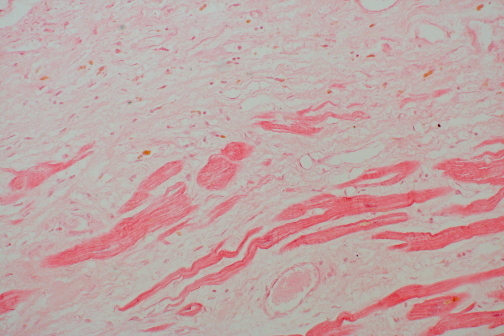 The myocardium shown demonstrates pale fibrosis with collagenization following healing of a myocardial infarction. There is minimal cellularity; a few remaining viable red myocardial fibers are present. This stage is reached about 2 months following the initial ischemic event. This collagenous scar is nonfunctional for contraction and will diminish the ejection fraction. Such a scar will not rupture.